From Chaos to Harmony with Humour and Heart. Looking for a one-of-a-kind and effective speaker? You’ve found it with Sharon Campbell-Rayment. Sharon inspires people with her unique insights on how to gain inner balance and mental strength so they can sail smoothly through set-backs and distractions. She will show you with humour and empathy how to break through the brain’s negative circuits for more positive outcomes. Sharon is one of only 60 people in the world with “Foreign Accent Syndrome”, which occurred after fall off a horse left her with a traumatic, acquired brain injury and medical diagnosis of “completely disabled”. You’ve got to hear Sharon’s story! What she’s learned will inspire you and help you gain the gift of inner peace, focus and positive action. 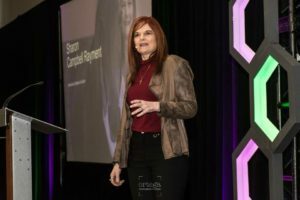 Why should Sharon be your Keynote Speaker? Email Sharon to book a call where you can discuss specific details.